Doug Chorney is being TERRORIZED by a Lunatic-Enviro-Doctor with DEPRAVED INDIFFERENCE. Lunatic-Enviro-Doctors like to SPREAD TERROR with INSTANTANEOUS DIAGNOSES of UNVERIFIABLE and IMAGINARY PROBLEMS pertaining to pest control products and fertilizers. On more than one occasion, these UNETHICAL LUNATICS have reacted in a predictable and often DEVASTATING fashion once informed that a patient has worked in the Green Space Industry and Agriculture Industry, and including the HATED Golf Industry. Lunatic-Enviro-Doctors faced while evaluating serious medical problems have been known to conclude WITHIN MERE SECONDS that exposure to pest control products, and even fertilizers, are definitely responsible for ANY ailment. It can be said that Lunatic-Enviro-Doctors are truly guilty of DEPRAVED INDIFFERENCE, PROFESSIONAL MISCONDUCT AND INCOMPETENCE, and HORRIFYING MISCHIEF. Before seeking the services of ANY doctor, ask if they are active members in Anti-Pesticide and Anti-Fertilizer Terrorist Organizations like Canadian Association Of Physicians For The Environment. Who Is Doug Chorney ? In 2011, Doug Chorney was elected President of Keystone Agricultural Producers ( KAP ), and served as Vice President in 2010. Chorney is a producer from East Selkirk, Manitoba. Cereal, oilseed and forage seed crops make up most of the 1500 acres on his farm, however, Chorney also grows and sells fresh vegetables right off the farm. Chorney has served as Chair of the Workplace And Employment Committee and the Rural Development And Land Use Committee. Chorney believes that new opportunities for producers to be part of the energy economy will help drive farm profitability in the future. Chorney holds a Degree in Agricultural Engineering from the University of Manitoba, and had worked in the resource and aerospace industries prior to coming back to the family farm full-time 17 years ago. Keystone Agricultural Producers is a democratically-controlled general farm lobby organization which represents and promotes the interests of agriculture and agricultural producers in Manitoba. Keystone Agricultural Producers is a grass-roots organization wholly run and funded by its members, with all policy set by producers throughout Manitoba. Mr. Chorney is among several LEADING EXPERTS who have recognized expertise, training and background in matters concerning pest control products. Mr. Chorney is among the LEADING EXPERTS who possess recognized expertise, training and background in matters concerning pest control products. Mr. Chorney is also one of Western Canada’s MOST EFFECTIVE and CONSISTENT SPOKESMAN on the subject of public policy and pest control products. In Letters To The Editor across Western Canada, Mr. Chorney has effectively and consistently spoken out against activists and anti-pesticide prohibitions on a frequent basis. Mr. Chorney SPEAKS THE TRUTH ― and deserves CONGRATULATION. Unfortunately, Mr. Chorney is being TERRORIZED by a Lunatic-Enviro-Doctor with DEPRAVED INDIFFERENCE. KAP president Doug Chorney recently spent a night in the hospital after being sprayed by liquid nitrogen 28-0-0 when a hose was uncoupled. The Canadian Fertilizer Institute recommends that farmers handling fertilizer products talk to their agri-retailers concerning safety measures. 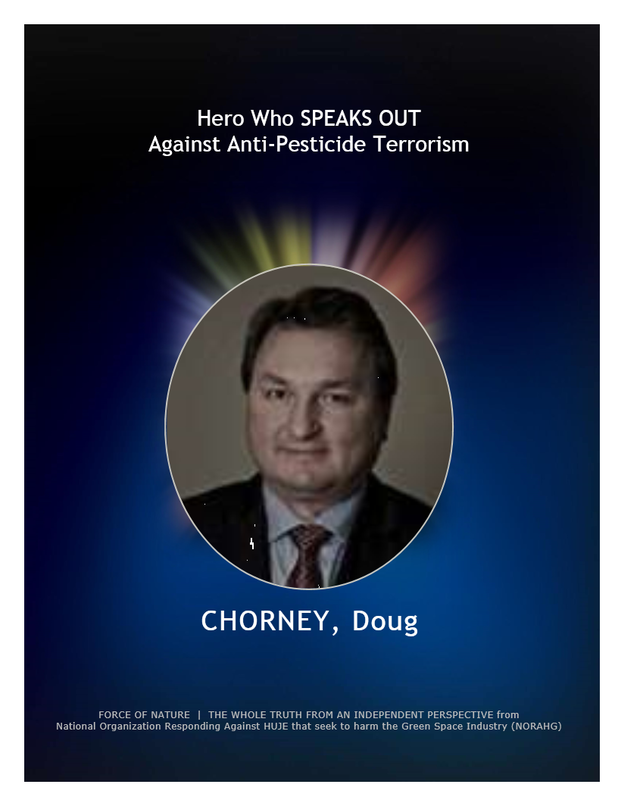 First off, we wish Chorney a speedy recovery, especially since he is an EXTREMELY VALUABLE ASSET in the WAR AGAINST Anti-Pesticide TERRORISM. Second, the assessment from Chorney’s doctor is RIDICULOUS and ABSOLUTELY IMPOSSIBLE. There is NO POSSIBILITY that anyone could be somehow dehydrated so quickly just because of some exposure to fertilizer. Moreover, the doctor somehow overlooked the fact that Chorney became dehydrated while outside, exposed to direct sunlight, on a 1500 acre farm. Chorney is middle-aged and over-weight. And yet, the doctor concluded WITHIN MERE SECONDS, with NO LABORATORY DIAGNOSIS, that exposure to fertilizer was definitely responsible for Chorney’s ailment. What can be concluded from this story ? Chorney is being TERRORIZED by a Lunatic-Enviro-Doctor with DEPRAVED INDIFFERENCE. Chorney should get away from this doctor as quickly as possible. Unfortunately, Chorney has VALIDATED an issue where sufficient FERTILIZER TERROR already exists. Moreover, Chorney’s experience with this Lunatic-Enviro-Doctor is the SAME as the one with Gordon Witteveen. Who Is Gordon Witteveen ? Gordon Cornelis Witteveen passed away on December 16th, 2010, in a Toronto-area hospital, as a result of complications arising from chronic leukemia. He was 76-years-old. Witteveen was a FOUNDING FATHER of the Modern Golf Course Superintendents Industry. He was, without a doubt, a GREAT UNFLINCHING SUPPORTER and FRIEND and ACTIVIST for all Golf Course Superintendents, across Canada and around the world. Witteveen himself was a LEGENDARY and an ICONIC GOLF COURSE SUPERINTENDENT. Furthermore, he was a GIFTED and PROLIFIC WRITER, and a RENOWNED AUTHOR. He was also an ACCOMPLISHED TEACHER and LECTURER. 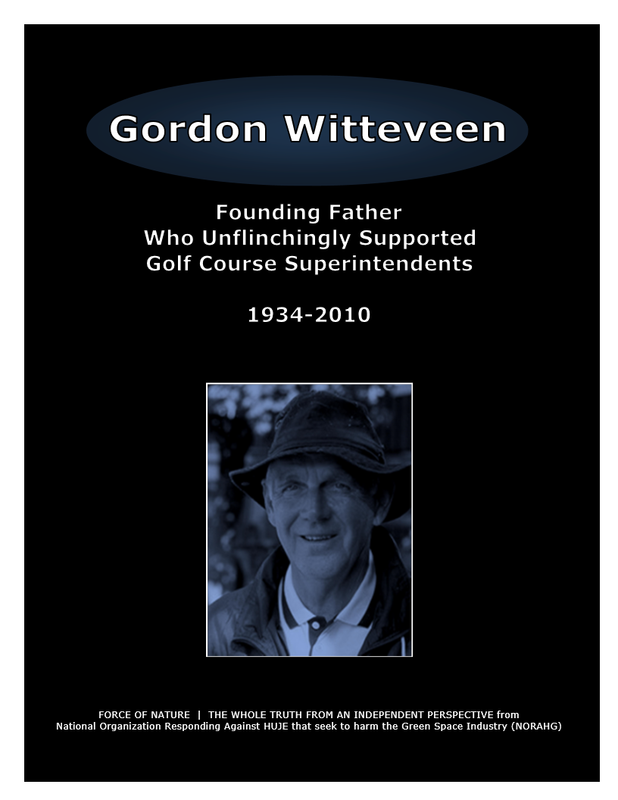 Witteveen was also a MENTOR for DOZENS of aspiring Golf Superintendents. Unfortunately, in his final months, Witteveen was TERRORIZED by a Lunatic-Enviro-Doctor with DEPRAVED INDIFFERENCE. Gordon Witteveen was afflicted with Chronic Leukemia. Witteveen wondered … leukemia and pest control products. Is there a correlation ? About five years ago, I was diagnosed with chronic Leukemia also known as CMML. Since then much of my time has been spent at blood labs, hospitals and doctor’s offices. My spleen has been removed, and there have been numerous tests to check and double check all my organs. All the various components of my blood are either too high or too low. When the platelets are low, I bruise and bleed prolifically and when the hemoglobin is low, I tire easily. I have become part of a study that monitors my condition at a prominent Toronto hospital. In spite of the above, I have remained active in my daily life. I bicycle often on my 21-gear hybrid touring bike. I also play golf at least twice a week, do my stretching exercises, and lift modest weights to keep up my strength. Just the same, I am often exhausted and take frequent naps. During my latest consultation, I got up the nerve to ask the doctor what the chances were of the chronic stage becoming acute. Without hesitation she answered : “ 30% ”. I was not dismayed by those odds because chances are that I will die of some other cause during the next decade. I then asked if there was CORRELATION BETWEEN MY CONDITION AND MY LIFE-LONG EXPOSURE TO PESTICIDES. Her quick response took me off guard, and it has been on my mind ever since. I have yet to come to terms with it. On the one hand, I have always believed that the prudent application of pesticides was beneficial. Now I am on the other side of the equation and am not so sure about the benefits of pesticides. The Bottom Line ― Gordon Witteveen DID NOT develop Chronic Leukemia because of pest control products. Just as Chorney DID NOT GET DEHYDRATED BY FERTILIZER. Besides, as a Golf Superintendent who operated PRESTIGIOUS Golf Facilities, Witteveen was NOT routinely and directly involved with the application of pest control products. How can anyone allow a Lunatic-Enviro-Doctor with DEPRAVED INDIFFERENCE near someone as ill and as vulnerable as Witteveen ? Throughout his entire life, Witteveen was a man who was ENERGETIC, INDEFATIGUABLE, and ROBUST, with BOUNDLESS ENERGY. Some observers have surmised that this MIS-DIAGNOSIS by the Lunatic-Enviro-Doctor may have led to his RAPID and UNFORTUNATE demise. Moreover, Lunatic-Enviro-Doctors like to SPREAD TERROR with INSTANTANEOUS DIAGNOSES of UNVERIFIABLE and IMAGINARY PROBLEMS pertaining to pest control products and fertilizers. On more than one occasion, these UNETHICAL LUNATICS have reacted in a predictable and often DEVASTATING fashion once informed that a patient has worked in the Green Space Industry and Agriculture Industry, including the HATED Golf Industry. Lunatic-Enviro-Doctors faced while evaluating serious medical problems have been known to conclude WITHIN MERE SECONDS that exposure pest control products, and even fertilizers, are definitely responsible for ANY ailment. This latest Enviro-Lunatic ATTACK against Doug Chorney, a highly-regarded representative of the Agriculture Industry is yet another sign that AGRICULTURE IS NEXT ! We face a hostile ideology global in scope, atheistic in character, ruthless in purpose, and insidious in method. LUNATIC ANTI-PESTICIDE PROHIBITION commenced against the urban use of PEST CONTROL PRODUCTS. 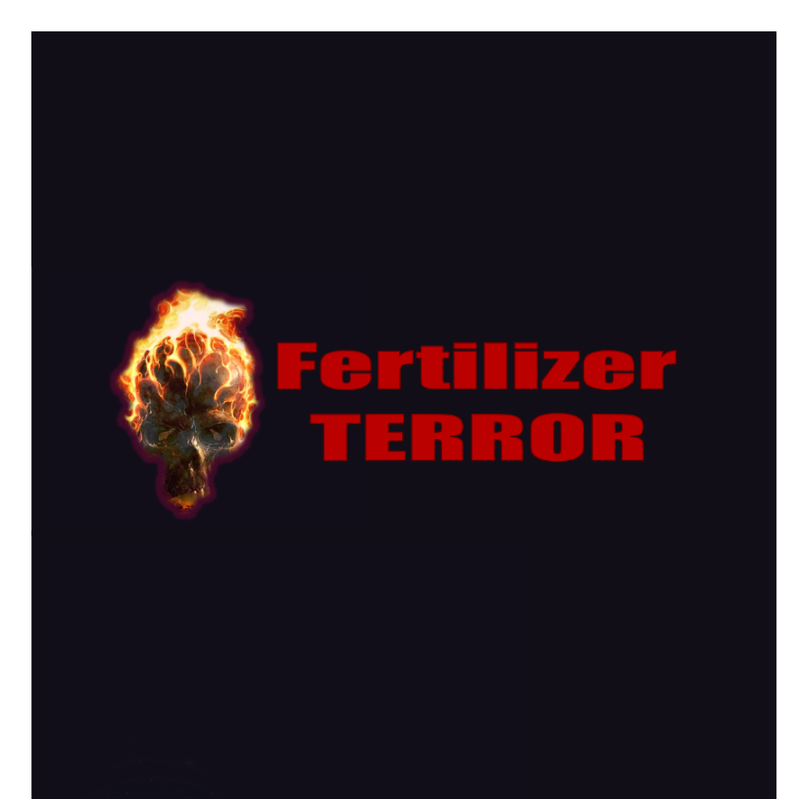 ENVIRO-TERRORIST ACTIVITIES have now spread against FERTILIZERS. ENVIRO-TERRORIST ACTIVITIES will next eliminate pest control products from the HATED GOLF INDUSTRY. and then … NURSERY PRODUCTION. and finally … LUNATIC-TERRORIST PROHIBITION will spread NATIONALLY against ALL pest control products and even fertilizers. The ANNIHILATION Of The Agriculture Industry Is IMMINENT ! Growers in the Agriculture Industry are being LULLED into LUNATIC LA-LA LAND. Growers who DO NOT want to get too involved with the issue of the PROHIBITION against pest control products used in the Urban Landscape. 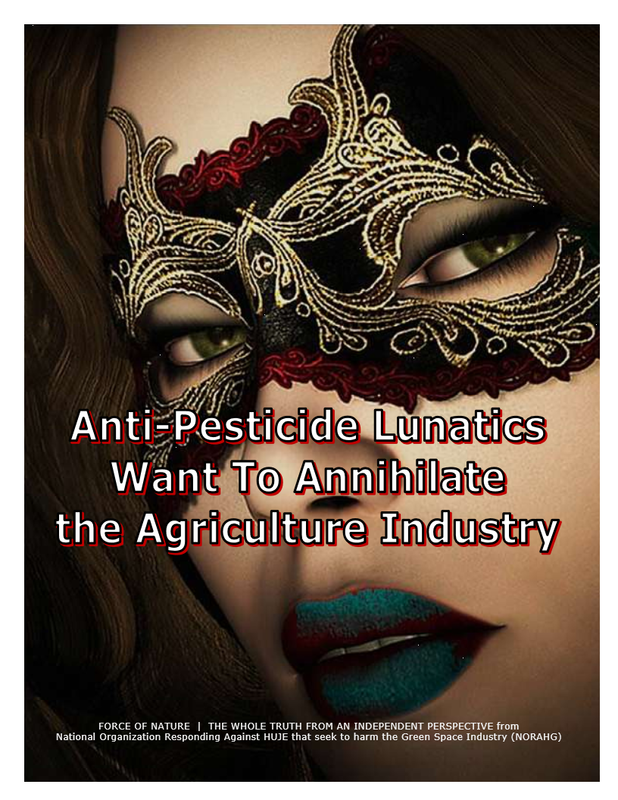 For growers, LUNATIC LA-LA LAND is a euphoric dream-like mental state detached from the reality that Anti-Pesticide Enviro-Lunatics will IMMINENTLY ANNIHIHILATE the Agriculture Industry. Cancer-Lunatics from Canadian Cancer Society want to DESTROY the Agriculture Industry ! Growers are DELUDED into believing that the Agriculture Industry will be FOREVER granted an EXCEPTION STATUS from Anti-Pesticide PROHIBITION. Growers DO NOT understand that the HATED GOLF INDUSTRY also enjoys an EXCEPTION STATUS, which itself will be SHORT-LIVED. Both GOLF INDUSTRY and AGRICULTURE INDUSTRY use the VERY SAME ingredients for the control of pests. If it is safe to eat pesticide-treated food, then it is safe to play on pesticide-treated golf courses. Anti-Pesticide Cancer-Lunatic Terrorists DISAGREE ! Cancer-Lunatics want to DESTROY their Agricultural Businesses, as well as their assets, their customers, their homes, their lifestyles, their job security, their families, their children, their loved-ones, and their future. Canadian Cancer Society, and other Anti-Pesticide Terrorist-Organizations, are planning to ANNIHILATE the Agriculture Industry.